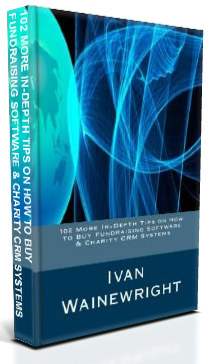 I have just published this new book: a collection of 102 tips for charities who want to buy a new fundraising database or CRM system. It is compiled from a number of articles I have published on my blog plus a series of brand new tips and in-depth analysis and advice. It is written for people whose day job is not the procurement of new databases - and you do not have to be technical to understand it. It is for fundraising managers, fundraisers, database managers, charity IT staff, those working in supporter services and indeed for anyone who has been given the sometimes daunting task of buying a new fundraising database or CRM system. It covers the basics of procurement (strategic advice, costs, software demos, project management) but also delves into more detail on supplier management, considerations about database development, the whole tender process and a chapter dedicated to the 'generic' CRM systems (Microsoft CRM, Salesforce et al) which are challenging the more traditional fundraising database packages. It is available as a paperback on Amazon, on Kindle and as a simple, instantly downloadable PDF document. It costs £20 (+ VAT for UK/EC residents). I hope it inspires, assists and enhances your buying process, whether you are already comfortable with a procurement exercise or even if you have never managed one before. Think of it as your own consultant seated by your side as you go along – only at a fraction of the cost! I hope you find it useful.